Oh, I so hated it when I used to access this comic and only see half the alt text. LOL. Not a fan of twitter and perhaps this is the reason why. How come we never have cool billboards? It would make the long drives much more fun. Meme's from the '20s? That's almost as old as All Your Base. Tooltips do cut off for me. I totally was not expecting the last line. I lol'd. And yes, I did create an account just to post on the forums for this comic. There were some good anti-gun control sequential rhyme-y billboards in rural Indiana. I say, this is a multiple-level win. This one reminds me that I don't know that much about internet culture. Ugg. Encyclopedia Dramatica to the rescue. Again. sje46 wrote: This one reminds me that I don't know that much about internet culture. Ha ha, they did have culture before the internet, sje46. They had memes and everything. Borrowed Irony wrote: I don't get this one. Anyways, I looked it up on Wikipedia. I get it now. Except that I don't go on Twitter. This is absolutely awesome! And I wonder, honestly, how much of your audience is going to "get" this. I read a book on the burma shave story years ago. I would love to find it again. The first real advertising fad, where ads became entertainment. (And eventually, public service anouncements). What's funny, was how the competitors to Burma Shave tried to put up their own signs. It didn't work, because by that time, people had become so used to shouting out, "Burma Shave!" at the end of the series, they would do it even if it was from a competitor. More food for xkcd: People would try to read the signs going the other direction in reverse order and try to make sense out of them. I couldn’t tell that was a cell phone for a second… got thrown by panel 4, which looks as if the guy is examining his hands. Then they beep next panel. I do love my popup wikipedia/translator add-on yes I do. At least I know about the famous Wall-drug advertising campaign. Haha, I was guessing there'd be a few "huh?"s. I'm a mere 21, but Quantum Leap introduced me to the phenomenon. Er...y'all who don't know what Burma Shave was, *do* at least know what Quantum Leap was, right? Guys? I've gotta hand it to Randall; this is amazing. And I agree- I wonder how many readers will know what he's talking about before looking it up on wikipedia. Seriously though, half an hour and no mention of it? Didn't grow up in America, so I guess I'm excused for having had no idea what Burma-Shave was until now. Also how many minutes until this meme is a twitter epidemic? I say 17. I see this comic is already linked from the relevant Wiki page. I wonder how long it will last this time. Being of Australia, I had no idea what this was about until reading aforementioned Wiki. I still use Firefox 2 and just recently (a few weeksish ago) found this. It made me pretty happy. I used to view source and then ctrl+F the alt text that I could read to get the full alt text. And, even better, the notes at the bottom of the Wikipedia entry. One respondent, Arlyss French, who was the owner of a Red Owl grocery store, did submit 900 empty jars; the company replied: "If a trip to Mars you earn, remember, friend, there's no return." After he collected 900 more jars for the return trip, the company, on the recommendation of Red Owl's publicity team, sent him on vacation to the town of Moers (often pronounced "Mars" by foreigners) near Duisburg, North Rhine-Westphalia, Germany. I've gotta say... I'm really impressed with whoever added this to the wiki article so quickly... check the very last thing on the page..
QUICK, GET A BURMATMND UP, AND MAKE TONS OF THESE! THE CAPS MEAN IT'S URGENT! I've thought about this before. Isn't the author of this comic a programmer of sorts? A CSS tooltip would probably help make the alt text more browser friendly. I dont know what made me sign up to post this, but i thought id show my appreciation. 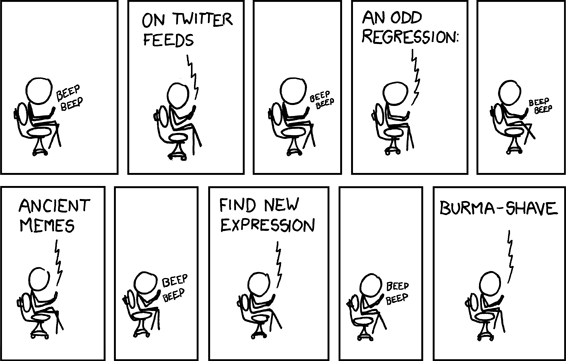 This is by far my favourite xkcd comic since the discovery channel song. malenkylizards wrote: Haha, I was guessing there'd be a few "huh?"s. I'm a mere 21, but Quantum Leap introduced me to the phenomenon. *sigh* I guess it’s true, there are no original thoughts left to express on the internet. I did a lot of reading up after that, and smiled wuite a bit at some of the rhymes and stories. There was one with a trip to Mars, look it up, it’s great. Discussed the ads with my parents too, who had fond memories. Y'all ain't heard of Burma-shave?! Well, yeah. They're old as dirt. Still, not only have I heard of them, I could swear I've seen them once or twice, and I'm 20. I do live in the South, though. We like our nostalgia down here. not entirely sure what twitter is, but if people start posting blogs and such and four stanza verse ending each post with "Burma-Shave" it will be one of the few internet memes that I heartily approve of. huh, firefox says "memes" isn't a word, and dictionary.com agrees. What's the correct plural of meme? Which firefox also says isn't a word, but here dictionary.com disagrees. Wow, I'm actually amazed that as many people know about Burma-shave signs as they did. I've heard about them from my grandmother, but the only time I've actually seen one was on the island of Put-In-Bay, Ohio. Ah, Burma-shave, I thank Bill Bryson for the knowledge of such things.